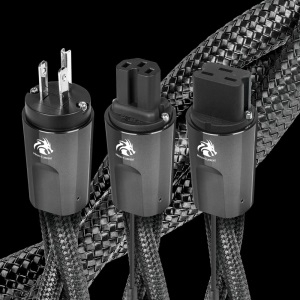 Audioquest Dragon High Current Power Cable - top of the line power cable for use with power conditioners, power distribution, power amplifiers, integrated amplifiers, powered speaker or powered sub woofers. It works wonders with anything that require a high current draw! Alternating Current (AC), is a far-from-perfect power source. AC power technology is well over a century old and was never designed to meet the exacting standards of today's high resolution audio-video components. AC noise is present at the utility source, and is then exacerbated by radio frequency noise that is induced (picked up by the AC power cord) and coupled to the component power supplies and to circuit ground. This creates distortion and low-level signal losses via the "masking effect. "� Further, power amplifiers can require immense reserves of transient current for their power supplies to react to and then stabilize during dynamic audio passages. Most AC power cords and power conditioner-regenerators, though helpful to a point, are simply not up to the task. Perfect-Surface Technology applied to extreme-purity silver provides unprecedented clarity and dynamic contrast. Perfect-Surface Silver (PSS) is AudioQuest's highest-quality metal. Solid conductors prevent strand interaction, a major source of cable distortion. Extremely high-purity Perfect-Surface Silver minimizes distortion caused by the grain boundaries that exist within any metal conductor, nearly eliminating harshness and greatly increasing clarity compared to OFHC, OCC, 8N and other coppers. With current capacity of 20 amps RMS @ 125VAC 50/60Hz (16 amps RMS @ 220-240VA 50/60Hz), Dragon can withstand current transient peaks many times its continuous (average) RMS rating. This makes Dragon ideally suited for a wide assortment of AC power conditioners, power regenerators, AC isolation transformers, and AC battery back-up devices, as well as any power amplifier, powered subwoofer, powered loudspeaker, powered receiver, or integrated amplifier.